Vivanta by Taj Bekal, Bekal, Kerala, India (photo by Geringer Global Travel, India tour operator). With five-star properties all over India—from bustling cities to beach towns, hill stations to historical hubs—Taj is recognized worldwide as a premier hospitality company offering elegant hotels and uncompromising service. Their truly distinctive India hotels have won awards ranging from the Condé Nast Traveler Reader’s Choice award to the Travel + Leisure World’s Best award. A haven fit for royalty—in fact, the Usha Kiram once hosted the King of England—this 120-year-old Gwailor institution is nestled in the heart of a magnificently manicured landscape. Guests can enjoy the luxurious environs of one of the 40 rooms, suites and villas, as well as cooking classes, a spa, a badminton court and three exquisite dining options. As you relax in one of the Taj Falknuma’s 60 resplendently restored rooms, it’s easy to feel as if you’ve been transported to a different time. Formerly the home of the Nizam of Hyderabad—the region’s monarch—this stunningly refurbished hotel recalls the grandeur of days gone by. As you enjoy the six dining options, as well as the pool, fitness facilities and custom tailoring, you may feel like royalty yourself. Once a princely palace, today Taj Rambagh welcomes visitors with the same opulence once reserved for monarchs. The architecture alone will leave visitors in awe and, once inside, the elegant touches will continue to dazzle. Colorful, exquisite art. Silk drapes. Gold-leaf frescoes and crystal chandeliers. Whether enjoying the trappings of the 79 restored rooms, strolling the 47 manicured acres, lounging by the pool, or savoring superb cuisine at one of the four restaurants, revel in the regal treatment offered at Taj Rambagh Palace. Nestled in 26 acres of lush gardens high above the “Blue City” of Jodhpur, Taj Umaid Bhawan Palace was once one of the largest private residences in the world. Now, it welcomes discerning travelers who fall under the spell of its Art Deco, Renaissance-meets-Rajput style appointments. Enjoy the refinements of regal living—this palace was designed and built for the Maharaja, after all—as you relax in one of the 64 luxurious rooms, stroll through the private museum, or enjoy a game of squash on the marbled court. The design of Taj Mahal Palace Hotel reflects the Mughal heritage of this region: pink sandstone, marble and grand domes mark this world-class, distinctive property. The 402 rooms—ranging form Deluxe to Presidential—are all lavishly decorated and exceedingly luxurious. With an emphasis placed on providing superlative service and a location right in the heart of this bustling capital, it’s no wonder this hotel has welcomed heads of state and celebrities as its guests. The Taj Mahal Palace is not merely a hotel—it is a piece of Mumbai history. Built more than 20 years before the Gateway of India, the Taj has been a hub of city life here since the turn of the 20th century. Every corner of this iconic property seems to tell a tale, and each of the 560 rooms and 44 suites exudes the sort of elegance you’d expect from a hotel that has welcomed princes and potentates from around the world. Feel the history and experience the excitement of staying at a truly legendary hotel. It is not a stretch to say that the Taj Lake Palace is one of the most romantic hotels in the world. Set on an island in the middle of glimmering Lake Pichola, this hotel is a former summer palace for the region’s erstwhile rulers. And this is an escape worthy of royalty: you can visit the indulgent spa, take a dip in the swimming pool or set off on a sunset cruise of the lake on a 150-year-old ceremonial barge. Each of the 66 rooms and 17 suites offer lavish décor and striking views out over the lake and to the Aravali Hills in the distance. Since 1835, this palace has been an oasis of peace amid the thrumming energy of one of the world’s oldest cities. The walls of this exquisite property are decorated with works of art from the maharaja’s private collection, and the 10 opulent suites feature original furniture that recalls the halcyon days of this historic space. Adding to the charm of the hotel are the peaceful gardens, mango orchards and marigold and jasmine fields. Spread over 40 acres—and a mere 20 minutes from the entrance of Banhavgarh National Park—Mahua Kothi is a superb setting for an India safari. Delightfully intimate (only twelve guest suites) and alluringly authentic (it was built to reflect the signature Central India style), this lodge offers a luxurious experience blended with a thoughtful approach to conservation. In addition to amenities like a swimming pool and an interactive kitchen, you’ll enjoy a world-class jungle safari experience led by trained naturalists. Every aspect of the Banjaar Tola has been created to combine luxury with authenticity: the pressed bamboo walls, the locally built, Indian-timber furniture and, of course, the lush location in the heart of the jungle. Set along the banks of the Banjaar River looking out over Kanha National Park, the 18 deluxe suites here are constructed with local materials like bamboo and sal. Thoughtfully constructed, this conservation-minded jungle getaway offers a unique blend of exploration and indulgence, offering everything from a swimming pool and butler service to tiger safaris. Drawing inspiration from the dry-packed stone houses of the Panna region, Pashan Garh is set atop a small hill with views over a grand forest and a wildlife-friendly waterhole. The 12 rough-hewn cottages fit the rugged landscape, yet they feature paradoxical comforts like leather furniture and artwork showcasing dramatic Panna landscapes. Pashan Garh is an ideal launching point for exploring the park, which is home to tiger, wolf, hyena, leopard, sloth bear, Indian crocodile and more. The camp is also just a short drive from the renowned temples of Khajuraho. Nestled in a teak forest amid ribbons of jungle streams, Baghvan is just ten minutes from Pench National Park, one of Central India’s lesser-known gems. The 12 suites are set beneath a shading canopy of trees, and each is spacious and distinctive with a machan (covered rooftop platform) and a bathroom with indoor and outdoor showers. When you’re not exploring the wonders of Pench on a jungle safari—and spying the rich diversity of wildlife here—relax by the pool, enjoy meals on the shaded deck or savor sunset cocktails beneath a beautiful banyan tree. Immediately upon arriving at this coastal oasis, your pulse may slow. This is a indulgent escape designed to slow time: whether unwinding amid the 56 acres of verdant gardens, meditating in the sun-drenched atrium or enjoying a restful sleep in one of the 140 air-conditioned rooms. 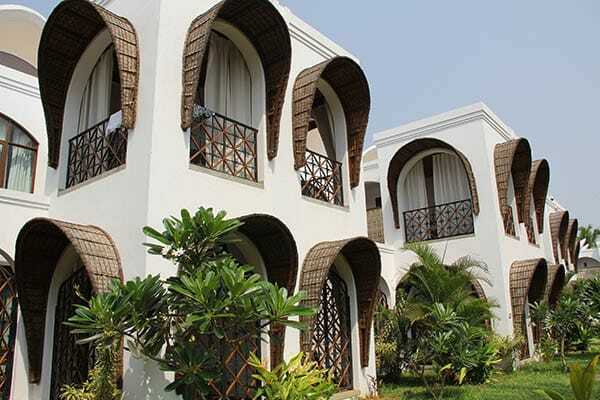 Exuding a Mediterranean charm while overlooking the Arabian Sea, this resort features six restaurants and bars, two spas (including one devoted to Ayurveda), a pool, a health club and a beauty salon. The resort is also ideally suited for families, offering a kid’s pool, activity center and a babysitting service. Amid the 26 acres of manicured lawns and gardens, this deluxe escape teems with Kerala charm with a tinge of Balinese allure. The 71 chic villas and rooms, designed to reflect the feeling of the region’s legendary houseboats, are havens of indulgence—some include private courtyards, outdoor baths and plunge pools. The range of activities here is dizzying—houseboating, kayaking, fishing, trekking, or even packing a picnic and setting off to explore spice plantations and historic forts. Back at the resort, you can unwind at the Jiva spa, take a dip in the pool, work up a sweat at the fitness center or simply gaze out at the tranquil backwaters. A blend of modern style and graceful Victorian charm, this hotel looks is in a superlative location overlooking the harbor. The newly renovated guestroom suites offer a unique mix of classic and contemporary, reminding you of the rich heritage of this city while enveloping you in comfort. While you’re here, experience everything this charming 96-room property offers: world-class cuisine, a superb spa, a refreshing swimming pool, 24-hour fitness center, beauty salon, game room and more. Plus, you’re in an ideal location just a half-mile from the center of Kochi. Both backwater retreat and indulgent seaside resort, the Green Garden Cove is a sanctuary of luxury in a picturesque setting. The 59 hillside cottages on this ten-acre property offer an alluring Kerala-meets-Bali ambience, and your private balcony looks out over the breathtaking surroundings. In addition to creative cuisine here, you can enjoy the host of amenities that make this truly a five-star resort experience: golf course, tennis court, swimming pool, health club, full-service spa and more. This inviting resort has been called “the little jewel of Kumarakom”, and as soon as you arrive you’ll understand why. The renewed heritage rooms, quaint cottages and luxury villas here all evoke the 140-year history of this place. Set on the banks of Vembanad Lake, this luxury retreat embraces its rustic surroundings while offering a superlative resort experience, including a nouvelle restaurant, a refurbished bar and the top-notch spa. Enjoy the world-class comforts and delightful surprises that come your way at Vivanta by Taj in Kumarakom. Ensconced in a picturesque Himalayan setting in the heart of the Thimphu Valley, the Taj Tashi is a worthy extension of the Taj ethos in Bhutan: striking dzong-like architecture, unmatched service and five-star ambience. Enjoy all the amenities that make this hotel singularly Taj and thoroughly Bhutanese: savor an imaginative meal at one of the on-site restaurants (including a Tibetan tea bar), pamper yourself at the spa or simply relax in one of the 66 elegant guestrooms. This resort is your gateway to a once-cloistered land rich in mythology and seemingly untouched by modern civilization. These hotels are suggestions of properties that can be included in a tour to India. We will be happy to customize an India itinerary to include Taj hotels where possible or to mix with other luxury properties. Contact us at 877-255-7438 or email us at info@geringerglobaltravel.com to discuss how we can create a personalized luxury India tour for you.